Emma Kotkin and Kathryn Neville Browne in Parthenogenesis. Photo by Patrick Cleary. BOTTOM LINE: A family drama in which the definition of “family” is turned inside out. Three women make up the family unit depicted in Patrick Cleary's Parthenogenesis. Theresa (Kathryn Neville Browne) is a middle-aged mom who conceived and raised her child solo after being cruelly abandoned by her own dad following the death of her mother. Theresa's daughter April (Sophie Walker) has spent her childhood resenting her mom and yearning to find her sperm donor. Meanwhile Ginny (Karen Lynn Gorney), the aunt who raised Theresa, tries to keep the peace between them while harboring her own secrets. Theresa’s life is about to change dramatically. April, now a college student, has become pregnant by one of her professors. As she’s coming to terms with becoming a grandmother, Theresa receives a communication from her long-lost father asking her to meet. She says she will, inviting her father to her home for dinner. As Theresa awaits his arrival, April shows up with her boyfriend Jack (Brandon Jones). Over the course of the evening, explosive secrets about love and identity will be revealed. 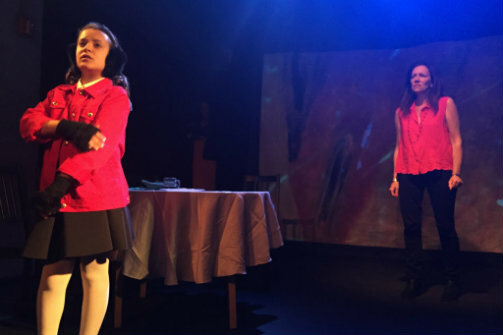 Directed by Ashley Marinaccio, Parthenogenesis is a messy mix of serious drama and soap opera. It blends important issues—childhood trauma, single parenthood, nontraditional families—with shocking revelations that strain credulity. Interestingly, its flashbacks and dream sequences tend to be more effective, and affecting, than the present-day action. Some of the cast, particularly Gorney, Jones, and the supporting players, are to be commended for finding the real and relatable among the less believable aspects of the script. If the name Karen Lynn Gorney seems familiar to you, that’s probably because Gorney starred as John Travolta’s dance partner and love interest Stephanie in the 1977 classic Saturday Night Fever. The Fringe truly is full of surprises. The questions at the core of Parthenogenesis—what makes someone a parent and what does one owe one’s children—are well worth exploring, particularly in our current era, in which technology has changed the landscape of conception and birth. However, in its current form, the play doesn't always rise to the challenge of tackling such heavy questions.